Emma Serena “Queena” Stovall has just been honored with a historical marker, the publishing of a new book–Inside Looking Out: The Art of Queena Stovall–and the current exhibition of her works on display at Lynchburg College’s Daura Gallery. Emma Serena Dillard “Queena” Stovall was born in Amherst County in 1887. She received the nickname “Queena” from her grandmother because of how other young children could not pronounce Serena. She married Jonathan Stovall, a traveling salesman in 1908. They had 9 children. Living in Lynchburg, Virginia during the fall and winter and spending the spring and summer at their farm in Amherst County, Virginia they had a good life. In 1949 Queena decided to pursue artistic ventures, she was 62. She enrolled at Randolph-Macon Women’s College to take art classes under the direction of Pierre Daura. Daura liked her natural style of painting so much that he suggested she stop taking classes with him and follow her own unique style without any outside influences. Queena Stovall’s artwork depicts both black and white Virginians in rural settings, which earned her the title of “Grandma Moses of Virginia.” She produced scenes of ordinary life such as crop harvests, funerals, jarring for the winter, baptisms, cooking and livestock and estate auctions. In 1956 she displayed her first solo exhibition at Lynchburg College. She continued to paint until her health started to fail in 1967. An exhibition of 44 of her 49 original oil paintings, along with five reproductions, are currently on display at Lynchburg College’s Daura Gallery. This is the largest collection of her paintings ever shown together. The exhibit will be open until April 13, 2018. After leaving Lynchburg College the exhibit will travel to the Virginia Museum of History and Culture in Richmond. It will be featured there between May 12 through October 14, 2018. The Daura Gallery also sponsored the publishing of the book “Inside Looking Out: The Art of Queena Stovall.” The 104-page book marks the first time all of Stovall’s works have been printed in color. Located along Route 130, in Amherst County, Virginia, the historical marker highlights her life and work. Located less than one-half mile from the farm where she lived for 35 years and painted it is a compliment to the strength of her artwork. 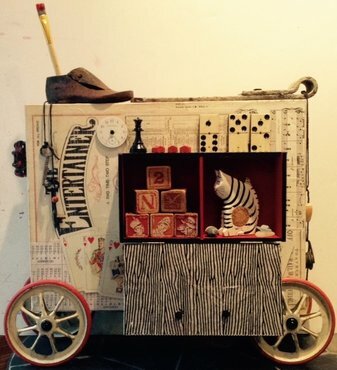 Have you been to Art on 12th, or commonly known as The Art Box? Not an artist? That doesn’t matter. Art on 12th is an arts community that includes 9 studios, 2 classrooms and a gallery. “Sister” stores and galleries are located in Crozet and Charlottesville. On Sunday, November 19, 2017, between 2:00-4:30 pm the artists in residence will open their studios to showcase their original works of art to the public and other artists in the area. 13 studios will be open. The majority of the artists who will be displaying their works are painters. But, painters using a variety of mediums, in an assortment of sizes and surfaces and levels of creativity that will peak your interest to learn more. Melinda Arthur-works primarily on small panels in oils, but enjoys working in pencil as well. 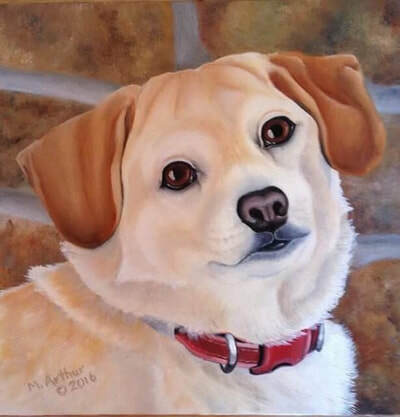 Specializes in pet portraits. David Eakin-a signature member of the Virginia Watercolor Society he has been painting for 30 years. He experiments with oil, Gouache, Acrylic paints and digital paint. Cheryl Hawkins-has worked in oils, watercolors but now works almost exclusively in acrylic. Enjoys different surfaces and adding collaging, stamping, texture and/or colored papers. Jim Hoban-enjoys both drawing and painting. Has a clear understanding of composition and color. Anne Novak-her favorite medium is glass enamel on copper. Creating such pieces is fascinating to her. More immediate work is completed with pigment sticks. Purnell Pettyjohn-everyday observations expressed in vivid watercolor colors. Christine Rooney-a freelance artist, she works in painting, drawing, pastels and encaustic painting. Rosalie Day White-small, quiet figures and landscapes showcasing small scale, jewels of light, form, value and shape. Art on 12th and The Art Box are housed in a building built in 1924, on the corner of 12th and Grace Streets, 422 12th Street. The upper floor houses the artist studios with French doors and huge windows to allow light to flood the spaces. The mezzanine level is where you will find the classrooms. The main level is The Art Box–Lynchburg, Virginia’s premiere source for all things art. Supplies for all ages and art abilities including painters, sketchers, pastel artists, printmakers, potters, bookmakers, fabric and leather artists, writers and gift givers. The store has an ever-changing selection, for all ages, of letterpress and artisan designed cards, fountain pens, tote bags, candles made from recycled wine bottles that are scented to mimic your favorite varietal of wine and jewelry. Classes are offered throughout the year in all types of art, for all ages and all skill levels. Visit their website www.artboxvirginia.com or call the store 434.401.1620.